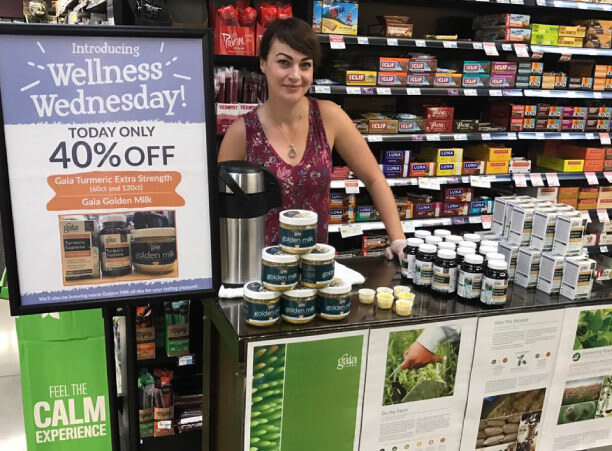 Visit our Wellness Department every Wednesday to enjoy flash sales, product sampling, and free wellness classes! Each week, we'll highlight a different product to sample and offer at a discouted price. We'll have representatives from the company or our own wellness department staff on hand to educate and answer questions on the product. Keep an eye on our Facebook and Instagram accounts for weekly Wellness Wednesday details! Be sure to check out our Wellness Wednesday classes and services! Confused about what to eat or not to eat? Want to gain an edge in your athletic abilities? Looking to remedy an injury? Hollan, owner of TrU Fitness and Nutrition, is a nationally-certified personal trainer and nutritional consultant that brings a life-changing individualized approach to optimizing your body through cutting edge nutrition, better movement mechanics and functional fitness. Some of her services include guidance in nutritional approaches to managing autoimmune disease, setting up a functional kitchen, cooking and meal prep for busy folks, food log assessments, and myth busting nutritional fallacies.